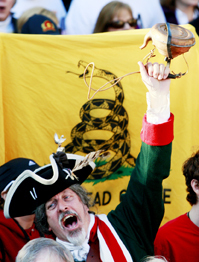 The Tea Party movement seemed to come out of nowhere. Suddenly, citizens angry over the multi-billion-dollar economic stimulus and the Obama administration's health-care plan were leading rallies, confronting lawmakers and holding forth on radio and TV. Closely tied to the Republican Party — though also critical of the GOP — the movement proved essential to the surprise victory of Republican Sen. Scott Brown in Massachusetts. Tea partiers say Brown's election proves the movement runs strong outside of “red states.” But some political experts voice skepticism, arguing that the Tea Party's fiscal hawkishness won't appeal to most Democrats and many independents. Meanwhile, some dissension has appeared among tea partiers, with many preferring to sidestep social issues, such as immigration, and others emphasizing them. Still, the movement exerts strong appeal for citizens fearful of growing government debt and distrustful of the administration.